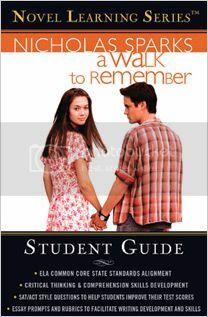 I recently received A WALK TO REMEMBER,THE NOTEBOOK,THREE WEEKS WITH MY BROTHER,THE LAST SONG and DEAR JOHN to review. 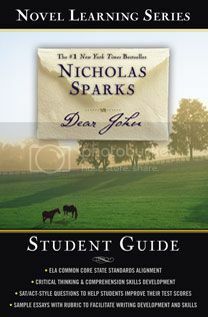 I have to admit I had never read any of Nicholas Sparks books before. Heck I had never seen any of the movies. 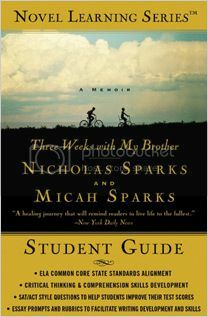 I have read a few of these The Novel Learning Series and I personally am not a big fan of his books but I know a lot of you are. 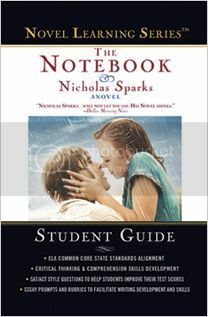 Anyways if you have teens or high school students these books are great for them because there are tests with SAT- and ACT-style questions in the book. These books are also good for adults because the questions gets you thinking.